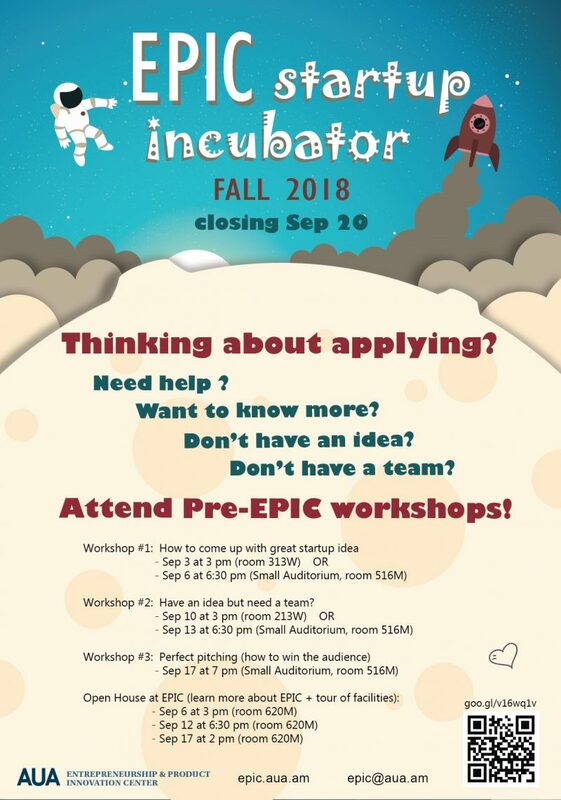 YEREVAN, Armenia – The Entrepreneurship and Product Innovation Center at AUA (EPIC) is accepting applications for the Fall 2018 Startup Incubation Program. The deadline for applications is September 20. The Program starts on October 1. The Startup Incubation Program is a 12-week coaching and mentoring process that aims to advance enrolled teams through the early stages of idea validation and business model development. During the program, resident teams learn to apply the Lean Startup framework methodology and are mentored by seasoned entrepreneurs and experts in their respective business domains. Teams of all backgrounds are welcome to apply provided they have at least one enrolled AUA student, alumnus, alumna, or staff member. In the past, teams have comprised students from other universities, non-students, and even a teammate still in high school. Accepted teams will have access to AUA faculty and alumni and to innovative co-working space, meeting rooms and hot desks. Throughout the Program, the teams will receive advice and guidance from seasoned mentors and coaches. Moreover, EPIC residents will have the opportunity to access the University’s unique prototyping lab with cutting-edge equipment, including 3D printers, 3D scanner, and CNC milling and vacuum casting machines. EPIC is the first university-based startup incubator in the Republic of Armenia. With unmatched resources within easy reach, EPIC supports AUA students, alumni, and other emerging entrepreneurs to advance their ventures from idea to success. “EPIC is a perfect place to validate your idea, team up with like-minded people, and successfully start your business,” states former EPIC resident, Vahagn Grigoryan (MBA ’14). EPIC teams continue to achieve growth and success. Most recently, the EPIC Breedge team participated in the Microsoft Imagine Cup 2018 World Finals in Seattle and the Currencii team placed second in the venture competition finals at the 2018 Sevan Startup Summit. For more information visit epic.aua.am/fall2018batch/.